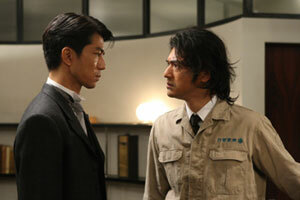 (left) Toru Nakamura and Takeshi Kaneshiro, and (right) Takako Matsu in K-20: The Legend of the Mask. Silly and occasionally draggy, but also rather fun. K-20: Legend of the Mask is an entertaining superhero movie that works thanks to its alternate Japan history, its steampunk trappings, and the always-watchable Takeshi Kaneshiro. Fun for general audiences and families, if not the demanding legions who worship at the altar of The Dark Knight. Takeshi Kaneshiro is a star, no doubt about that. There are few actors that could take a preposterous, slight action-adventure like K-20: Legend of the Mask and make it so watchable, and Kaneshiro is one of them. Directed and written by Shimako Sato, K-20 takes place in 1949 in an alternate Japan where World War II never happened. Japan has continued beneath Imperial Japanese rule, with the upper and lower classes strictly separated, and tension existing between the haves and have-nots. Springing from the bubbling unrest is K-20 a.k.a. Kaijin Niju Menso or "The Fiend with 20 Faces", a cloaked thief who steals from the rich ostensibly to benefit the poor. Opposing K-20 is Kogoro Akechi (Toru Nakamura), a renowned detective who solves crimes with the help of his teenage assistant Kobayashi (Kanata Hongo). Akechi is due to marry Duchess Yoko Hashiba (Takako Matsu), with their engagement being all the media rage. Amidst this, naïve lower-class circus acrobat Heikichi Endo (Takeshi Kaneshiro) is asked to snap photos of Akechi and Yoko’s engagement, with a large financial reward as compensation. Heikichi needs the money to pay for the circus ringmaster’s (Fumiyo Kohinata) medical bills, so he agrees, but Heikichi is mistaken for K-20 at the scene and arrested. Realizing that he’s been framed by the real K-20, Heikichi manages to escape with the help of thief and inventor Genji the Gimmick (Jun Kunimura). Heikichi is now a wanted man, and decides to find and do battle with K-20 in order to clear his name. But how wil Heikichi find K-20? Simple, he’ll accidentally spot him on the rooftops when he’s in the midst of his training. K-20’s plot moves with utter convenience, sometimes stopping for static exposition before moving into action sequences set against CG-generated views of the Teito (a.k.a. Tokyo ) cityscape. The film takes flight during the scenes of Heikichi’s training; he runs and jumps through the city using entertaining Parkour moves, with the filmmakers doing a decent job of switching between Takeshi Kaneshiro and his obviously more athletic stunt double. The film finds its footing there, managing a fun if ridiculous vibe that recalls a swashbuckling adventure or a live-action approximation of early Hayao Miyazaki. The steampunk trappings and cartoonish acting add to the live-action anime flavor. A lot here is preposterous; people take far more punishment than they should, the humor is sometimes flat in its delivery, and the ultimate plot – the search for an electricity-controlling device created by famed inventor Nikola Tesla – is more convoluted than it needs to be. Director Sato hits a few bumps with her storyline, and the film grinds to a halt whenever anyone discusses anything serious. However, with an actor like Kaneshiro in the lead, suspension of disbelief is quite easy. Kaneshiro has star presence to spare, and is naturally charming and convincing as characters that could exist only in the movies. Kaneshiro effortlessly earns sympathy as the dopey and even clueless Heikichi, and when he’s zipping across the Teito skyline like Spider-Man or Batman (Heikichi uses a nifty spring-loaded grappling gun), managing a smile is easy despite the ridiculousness of it all. This isn’t really a superhero film – it’s a live-action fantasy. K-20 is based on the work of legendary mystery writer Edogawa Rampo, and The Fiend with 20 Faces was originally an arch-nemesis of master detective Kogoro Akechi, popularly known as the Japanese equivalent of Sherlock Holmes. Sato’s screenplay (based on a novel by So Kitamura) departs heavily from Rampo’s prolific work, making Akechi a supporting character and setting the whole thing in an imaginary world where World War II never happened. There’s minor commentary here about class division, with Takako Matsu’s spunky class-bridging heroine spouting corny, if well-meaning dialogue. The sentimentality in K-20 is of your standard commercial type, which means it’s expected and completely unchallenging. However, the emotions ultimately prove quite tolerable, and at least reference familiar, universal concepts and not audience-polarizing nationalism.